Can't wait to see Prince George and Princess Charlotte. The bridesmaids and page boys who will walk down the aisle of St. George’s Chapel on Saturday at Prince Harry and Meghan Markle's wedding have now been announced. As expected, Harry's nephew and niece Prince George and Princess Charlotte are in the pack, but so too are eight other children including Markle's best friend Jessica Mulroney's children and Markle and Harry's respective godchildren. 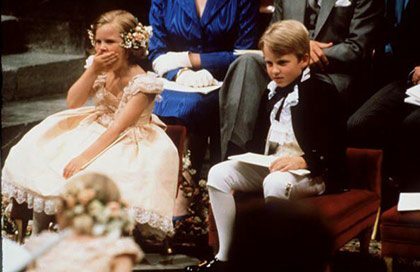 The involvement of children in a wedding procession always puts a smile on the congregation and bride and groom's faces. 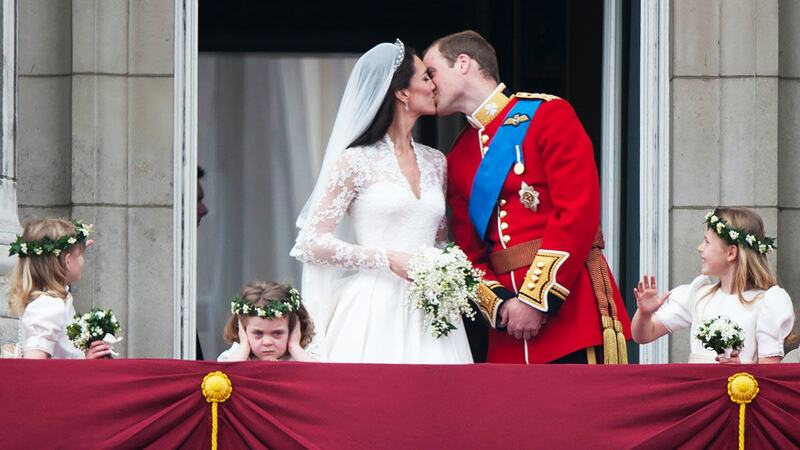 Given George and Charlotte's existing reputation for the sweetest moments and resulting photos, we're sure this weekend's wedding won't be any different. 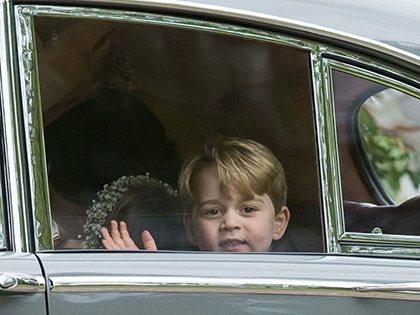 The smiling page boy waved to crowds after leaving the church where his aunt Pippa got married. 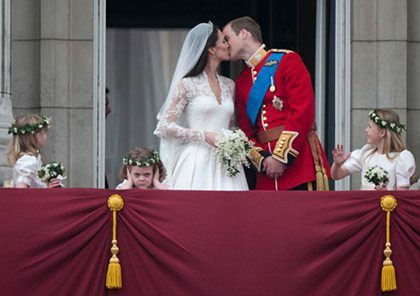 Prince William's goddaughter Grace stole the show at the 2011 nuptials when she grumpily put her hands over her ears while the royal couple had their balcony kiss. 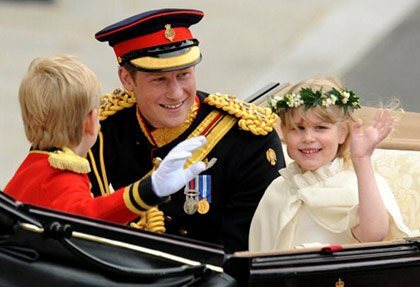 Prince Harry accompanied his cousin Lady Louise Windsor, the daughter of Prince Edward and the Countess of Wessex, in the carriage on the way to Westminster Abbey for his brother's wedding. 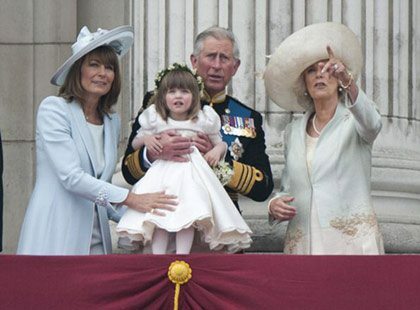 The little three-year-old, who is the Duchess of Cornwall's granddaughter, was held up by Prince Charles and supported by Carole Middleton to watch the airshow display from the balcony of Buckingham Palace. 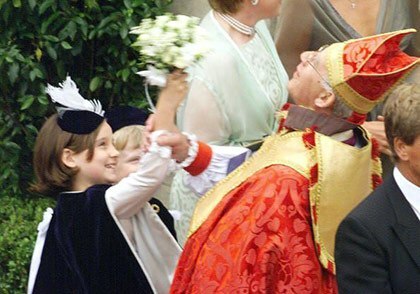 Eight-year-old Camilla, who is Edward’s goddaughter, was seen jokingly pushing her flowers into the Bishop of Norwich's nose before they entered the church. 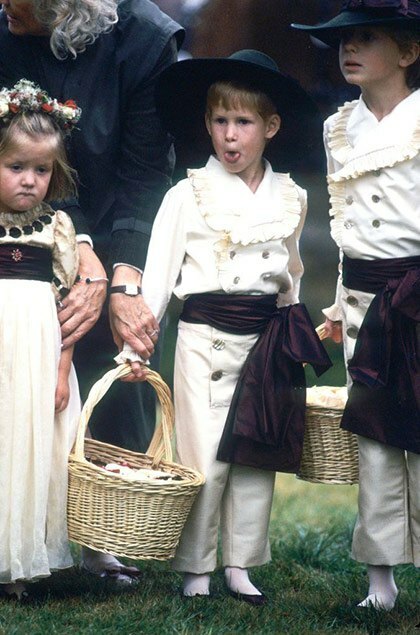 A five-year-old Prince Harry stuck his tongue out to photographers at his uncle's wedding in the late 1980s. Just look at that hat! 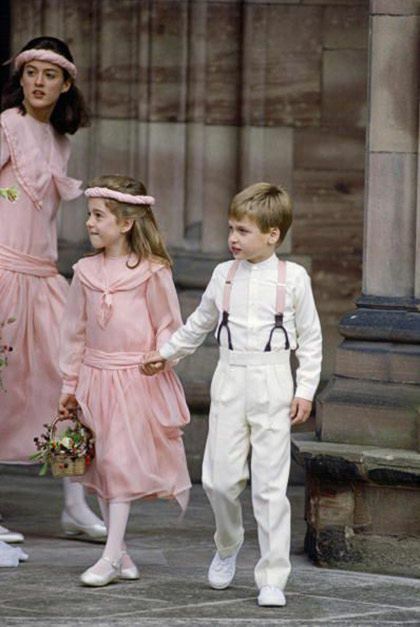 A six-year-old William coordinated with the pink color scheme to serve as a page boy to Camilla Dune, who had Princess Diana as a godmother, and Rupert Soames—the grandson of Winston Churchill. 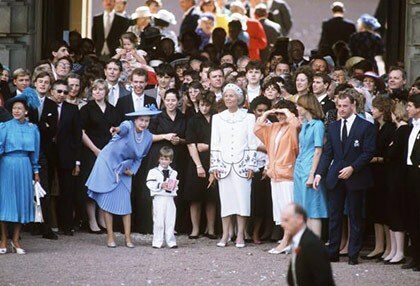 Page boy Prince William is shown something by his grandmother the Queen in this photo after the wedding of his uncle, Prince Andrew, to Sarah Ferguson. 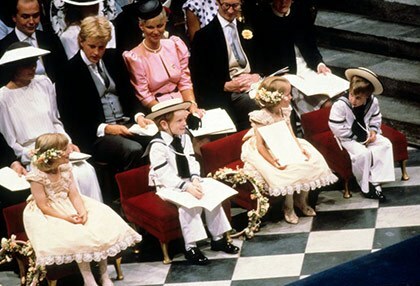 Four-year-old William (far right) wore a sailor-style page boy outfit during the iconic '80s wedding. Here he is sat with his fellow page boy and bridesmaids in Westminster Abbey during the ceremony. The Duchess of York's younger sister and brother, Alice and Andrew, looked a little worn out during the service. It's a long day, after all. 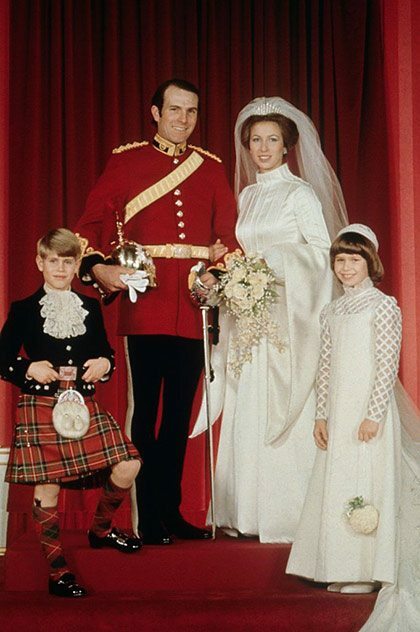 Anne's nine-year-old brother Andrew served as a page boy in a tartan kilt at her wedding to Olympic athlete Mark Philips. 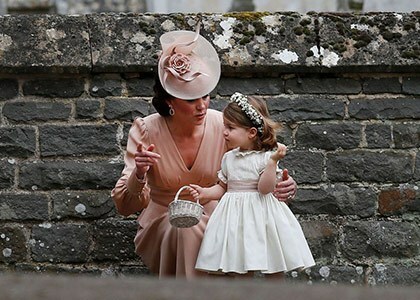 Her bridesmaid was her cousin Lady Sarah Armstrong-Jones, the only daughter of Princess Margaret. 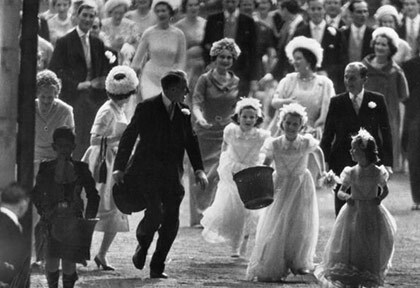 Charles (far left) and Anne (middle of bridesmaids) picked up the pace while carrying confetti baskets at their aunt's famous wedding. This article originally appeared on GoodHousekeeping.co.uk. Minor edits have been made by the Cosmo.ph editors.